Looking for a unique way to keep toes warm this winter? Stuck on a creative gift idea for a man in your life? Since it's Winter now, I thought it would be "cool" (ha, ha) to share this small round-up of manly gift ideas, all related to, wait for it, socks - hey, it's cold out there, and socks keep you warm and toasty! (+) How Does She gets really creative and makes a boring gift of socks into a sock bouquet (complete with rolling-sock-into-flower instructions). 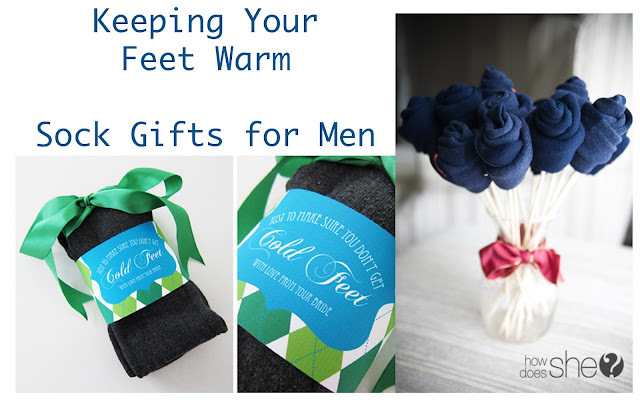 (+) For the DIY type, The Pretty Blog features a free printable wrapper for groom's socks. Who knew I could write a whole post all about gifting socks?! You know it's funny, but I bet everyone would be surprised how many men need socks. They never buy them for themselves. I usually slip them into a Christmas stocking, but I like this idea a lot too. Thanks for sharing.